The University of Rhode Island’s Rotaract Club raised $400 in donations for its Rock N’ Skate event to support its End Polio Now Campaign on Saturday night. The event was held at the Bradford R. Boss Ice Arena on the Kingston campus and was open to the public at the cost of $5 for admission which all went towards charity. The money raised was matched by both the Wakefield Rotary and the Bill & Melinda Gates Foundation, totaling $1,200 raised for the campaign. The goal of the End Polio Now Campaign is to fight polio in third-world countries. The club operates under Rotary International, which is a well-known service society that aims to bring business and professional leaders together in order to provide humanitarian services, encourage high ethical standards in all vocations and help build goodwill and peace in the world per Rotary.org. Since 1979, the Rotarians have been committed to decreasing poliomyelitis, commonly known as polio, a “contagious viral illness that in its most severe form, causes paralysis, difficulty breathing and sometimes death,” according to the Mayo Clinic. The fight for the cause has been successful as 125 polio-endemic countries Â has now dropped to only three, Pakistan, Nigeria and Afghanistan, India also declared itself polio free for the first time in its history in 2012, according to the national Rotary website. 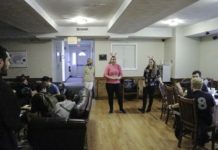 “The more we get involved with other groups on campus, the more we stay active in the community,” Sam Elemarczyk, a member of the University’s Rotaract Club, said. The URI Rotaract Club encourages the student body and the community to show support for World Polio Day on Oct. 24 by wearing Keaney blue. The group is open to all students and meets every Monday from 6:30-7:30 p.m. in Room 360 of the Memorial Union.